1991 February SPIN Whole band interview (interesting anecdotes) but Flea is featured on the cover. 1992 January-February RAW (89) Interview with Flea in his home about his record collection and musical tastes. 1995 February RAW (169) A 12 page RHCP special with an interview of Flea along with loads of full-page photos. 1995 October Guitar Flea and Dave Navarro- cover shows them kissing- talk about One Hot Minute. Some great photos. 1999 August RPM (Canada) Account of RHCP’s performance to open the new HMV website & store in Toronto but section on Flea’s underpants! 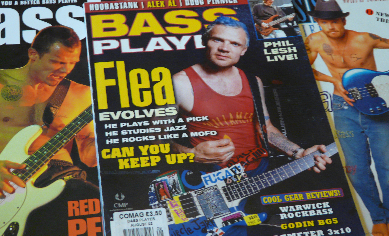 2004 Bass Player: Legends of Rock Bass (special edition) Two page article on Flea. 2006 July Guitar World A MASSIVE RHCP Section! Over 30 pages of interviews and photographs! Saint or Sinner: John Frusciante in-depth interview; John Frusciante’s guitar playing technique– Under The Bridge and Funk Brothers an interview with Flea about Red Hot Chili Peppers! 2009 January Kerrang! (1294) Brief article on Flea and his new range of Fleabasses. 2012 February Rolling Stone Several RHCP mentions including a Q & A session with Flea.